Kouts, Indiana, well-known historically for corn, hay, and pork, was at one time recognized in newspapers around the world for a sporting event that was exceptional given standards then and now. During the very early morning hours of Sunday, March 31, 1889, a boxing match for the World Featherweight Boxing Title (120 lbs.) occurred in this small town. This bout pitted Ike Weir, an Irishman known as the Belfast Spider, against Frank Murphy, a prize fighter hailing from Birmingham, England. The fight consisted of 80 rounds. at Kouts, Indiana, for the World Featherweight Title. Henrico County, Virginia. The World's Champion's Series, 1888. So how did these two men from across the Atlantic find themselves fighting one another in Kouts? Initially, the World Featherweight Title was to be fought in Chicago, with boxers wearing skintight gloves. To box in Chicago, however, fighters were required to wear four ounce gloves. 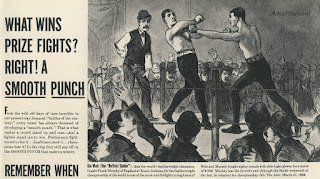 Promoters of the fight demanded that the fighters be allowed to wear skintight gloves, but officials in Chicago refused and the fight was not permitted to occur in the city. Eventually, word of the prize fight situation reached Kouts and plan was devised to move the fight there. Mike O’Brien’s Hall, two blocks south of the Chicago & Erie Railway depot, was booked for a Sunday, March 31st fight. During this period of time, O’Brien’s Hall was regularly used by Methodists of the area for Sunday services. A 14-car special train was chartered from the Chicago & Erie Railroad in Chicago. Weir and Murphy, their trainers, fight promoters, ring officials, bookies, and gamblers betting on the fight boarded the train in Chicago and headed east toward Kouts during the evening of Saturday, March 30. Pinkerton agents were also stationed on each car; as the train made stops on its way to Kouts, these agents kept individuals from boarding and creating chaos. In order to reduce the chance of an interruption from law enforcement, Kouts’ justice of the peace was, earlier in the day, taken to Valparaiso on business. The train arrived in town around 11:00 pm. O’Brien’s Hall was completely packed with people for the fight. The fight began at 1:05 am on Sunday. A megaphone was used to inform individuals standing outside the hall as to the action taking place inside. According the newspaper reports, the first 15 rounds consisted of quite a brawl, but afterward only a few of the remaining 65 rounds involved much physical contact. It was reported that many citizens of Kouts were rather upset with a boxing match taking place in their village. Several citizen protested but were either ignored or shouted down by boxing match visitors. Still protesting, the citizens decided to send for the sheriff in Valparaiso. The two boxers, worn out and injured by 80 rounds of fighting, along with the threat of those in attendance being arrested by the sheriff, the entire ensemble of boxing participants boarded the train cars and headed back to Chicago, arriving in the city at 10:30 am. Meanwhile, Mike O’Brien cleaned up the hall, preparing it for morning services. The local Methodists, however, were irate with O’Brien, dumbfounded that he would use a place of worship to support a boxing match. It has been reported that O’Brien stated that he earned more rent during that one night of boxing than he had all year from the Methodists. O’Brien’s Hall was later owned by William Hefron and converted into the Royal Blue Store. The structure was razed by fire on October 28, 1954. The Kouts Town Hall was constructed on the site in 1957 at a cost of $17,000. The fight was to be determined by knockout. 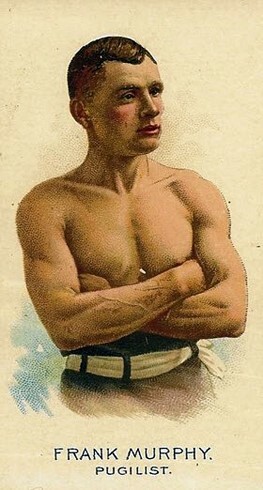 Billy Myers, the referee, stated at the end of 80 rounds that the match would resume within two days. Both men, however, sustained considerable injuries. The fight was never continued as stipulated by the referee. Consequently, both boxers split the purse, and Ike Weir retained the World Featherweight Title. 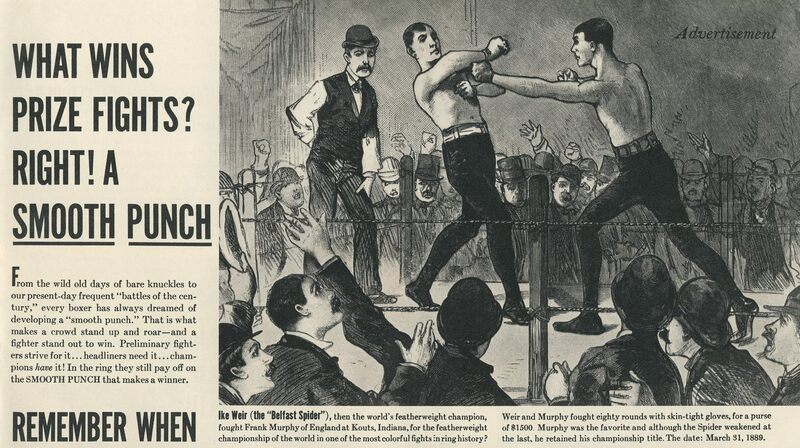 As a side note, though the featherweight class in boxing was established in 1860, the class was not universally recognized until the fight at Kouts on March 31, 1889. 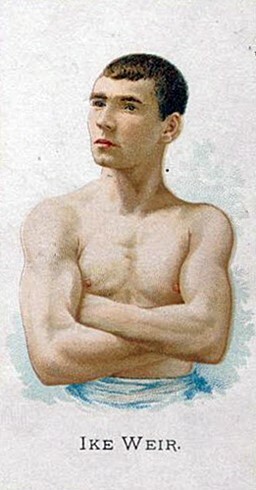 Therefore, though a draw was the result of the Kouts match, Ike Weir was proclaimed the first official Featherweight Boxing Champion based on his record prior to the match. The boxing match was reported in newspapers across the world. The following report from Monday, April 1, 1889, issue of the St. Paul Daily Globe provides a good account of the boxing match. Ike Weir and Frank Murphy Find the Walking First-Class in Indiana. They Are Scheduled to Fight, but Conclude to Have an Eight-Round Walk. Weir Exasperated the Little Englishman by Dancing Out of His Reach. Myer Says They Must Meet Again Before Tuesday, but They Wont. CHICAGO, March 31. -- At 6:30 this morning the featherweight prize fight between Ike Weir, the Belfast Spider, and Frank Murphy, the young Birmingham lad, with skin gloves, for the championship of the word, the champion belt and stakes worth $2,500 to the winner, came to an inglorious end. The scene of the mill was Kouts, Ind., a desolate hamlet come sixty miles out on the Chicago & Atlantic road. The referee, after the eightieth round, was obliged to call the fight off for the day, and to announce that it would have to be finished some time before Tuesday. It is extremely doubtful, however, if the men come together again, certainly not within that time, and another draw will have to go on record. The fight this morning was a most peculiar one. For eighteen rounds it was as scientific and hard-fought a battle as has ever been seen in the prize ring, but the other sixty-two rounds, save the sixty-seventh and sixty-eighth, amounted to absolutely nothing. In not more than ten of them was a blow struck, and most the time the men did not even put their hands up. The explanation for this act is the fact that after ten or twelve rounds the Spider’s hands went back on him and he could do nothing with them. Murphy, who proved himself a most plucky fighter and a most wretched general, failed to get any advantage out of Weir’s predicament, who kept dancing just out of the English lad’s reach. Another thing was that Murphy was in the better condition, and the great welts left from each blow showed that he had not been “rubbed” enough, as Billy Myers put it. The Spider proved himself much the cleverer of the two, and the way in which he sailed into Murphy during the first few rounds, smashing him first in one eye than on the other, then on the nose, and twice knocking him down with a resounding crack on the neck, convinced many that he could have won the fight had his hands held out. There were others, however, who were loud in their assertions that Murphy showed himself the better man of the two. He certainly proved himself to be one of the gamest men that ever entered the ring, and, with his two eyes almost closed, and in spite of having been sent to grass twice, he rushed his long-limbed antagonist all over the ring. This was in the early part of the fight, however. During the rest of it neither seemed inclined to do much of anything, and the two men alternatively chaffed and black guarded each other, the spectators occasionally varying the monotony of the proceedings by taking a hand in the talking match and urging the fighters to five them their money’s worth. After round after round had been fought without a blow, Weir made a splendid rally. The sixty-seventh and sixty-eighth were as lively as the most bloodthirsty could desire, and Weir almost had the little fellow knocked out. The spurt was a short one, however, and the old tactics were again resumed, under the instruction of the backers. When the spectators saw that nothing could be expected they soon tired of the show, and the postponement was really made at the crowd’s demand. Weir’s backer acted very square, and before the rally repeatedly urged the Spider to go in and fight even if he got licked. Parson Davies’ management of the affair was excellent, and his arrangements were all carried out like clock work. A special train guarded with Pinkerton men took the party down and back, and the crowd was a mostly orderly one considering. There was one of two little encounters between the sports and natives of Kouts which served to enliven the proceedings. A very queer specimen, representing himself as an officer, worked his way through the crowd, and cried “This fight is stopped.” “The ------- you say,” said one of the Chicago admirers of the manly art as he let him have one behind the ear, and send him rolling towards the doors. Another gave him a lift, and the man finally reached the outside in somewhat dazed condition. After the fight Weir showed but little punishment, though he said his ribs were frightfully sore and he thought his jaw was broken. Murphy was badly bunged up. His eyes were almost closed, and one his ribs was a lump as big as a California pear.At 1:05 a. m. time was called. The men sparred cautiously for a minute, when Weir led, but this blow was neatly stopped by Murphy, who countered. The Spider danced around in front of his antagonist swinging his long arms and showing his right to the name of “Spider.” Suddenly he led and landed on Murphy’s left eye, cutting a great gash below it. First blood claimed and allowed for Weir. When the men came together Weir again gave Murphy a frightful smash on the eye, which was now bleeding freely. Again the Spider led, and reaching Murphy again knocked him squarely down. Five hundred dollars to $200 was here offered by Weir’s backer with no takers. After ten seconds allowed for a knock-down had elapsed, the round closed without further damage.Heavy slugging marked the opening of the second round on both sides, Murphy coming to the scratch in an evidently wicked frame of mind. His eagerness led him too far, however, and partly from a slip and partly from a blow in the chest he went down. A moment later he slipped again. Now becoming more cautious but more resolute than ever he began a long, clever, gamy struggle. It was give and take till the close of the round. Each man had apparently increased respect for the other’s prowess at the opening of the fourth. Each was covered with blood, which came mainly from Murphy’s left eye and nose. The eye was in an awful condition, and Weir kept going for that organ, while Murphy directed his blows at Weir’s ribs. Close infighting characterized the fourth round in the first moments, during which Murphy got decidedly the worst of it. Sparring for wind ensured until just as the word time was called there was a sharp exchange of blows, each man getting a jaw-breaker. Round Five -- the men came quickly to the scratch and the Spider at one led again. Murphy was fighting gamely and got in a good cut on Weir’s ribs, but the wily Spider again swung his right and landed again on Murphy’s damaged optic, from which the blood was once more flowing in streams down Murphy’s neck and chest and bespattering Weir as well. The round was closed without further fighting. When time was called for the sixth round Murphy responded pluckily, and his eye had been stuck together anew with sticking plaster. Murphy led, but Weir danced out of his way, and then with an under-cut reached Murphy’s eye and scattered the sticking plaster, and blood flowed profusely. The round ended with light sparring. Round Seven -- Weir led again but the plucky Murphy was fighting well and stopped his blow and countered. There were frequent clinches, but the men obeyed the referee’s cry of “break away” promptly and Myer felt called upon to say in response to some comment from the crowd “the gentlemen are fighting nicely as I ever saw; leave them alone.” Weir got into another smash on Murphy’s eye before the round closed. Signs of exhaustion were visible in both men in the eighth. Murphy’s optic quickly got a fresh cut from Weir’s right, but Murphy’s solid stand was eliciting unbounded admiration from the crowd, and he was not failing to get in his work on the Spider’s ribs. Not less agile than the Spider, Murphy was much more stable. A spectator said: “Weir’s a song and dance man, Murphy is a fighter.” Weir now began a series of upper-cuts with his left, but he apparently accomplished little by the new tactics except to make the struggle more showy. It was noticeable that Weir, for some reason, let up on Murphy’s right eye, and turned his attention somewhat to the body blows, imitating Murphy. In the ninth Murphy seemed to get the best of it. Weir was rather winded, and Murphy got in three blows to the Spider’s one, but the Belfast’s man’s long reach was sufficient to make the intervals between Murphy’s success and too long to have a cumulative effect. Murphy seemed to be just warming up at the call for the tenth. He was not as strong as he at first appeared, however, for Weir managed to elude him by almost running away repeatedly. At the close Weir aimed a fearful backhander, but Murphy calmly turned away his head an inch and escaped. In the eleventh Weir showed what he meant by abandoning Murphy’s left eye. The Spider planted a stinger on Murphy’s right optic, and noticed with grim satisfaction that the left was completely closed. Weir then danced around and drove Murphy to the ropes, but there the latter got in a good blow on the neck. A series of mad rushes on each side, with frequent clinches, tells the story until the end of the fifteenth round, after which the men were too weak to keep up such work, and began a genuine walk-around. In the sixteenth and seventeenth rounds not a blow was struck or any sparring done.Round Eighteen -- Both men sparred very cautiously for an opening. Weir finally led, but fell short. Murphy did the same thing, and as the round closed Weir got in a good one on Murphy’s ribs. Round Nineteen -- Murphy’s eyes seemed almost shut. After a few moments of caution the Englishman made a vicious run, which the Spider dodged. The round closed without any damage to either. Round Twenty. Weir led as soon as Murphy had come to the scratch, a clinch followed, then a short lead from Murphy, and the round closed with the men cautiously walking around each other. Round Twenty-one. Another clinch opened this round as the result of Murphy’s lead. Weir got in a good one on the ribs, but at the end of the round the Spider seemed to be out of wind and a little sick at his stomack. Round Twenty-two. Murphy opened with a rush and got in a good crack on the Spider’s ribs, which were by this time considerably cut up. Weir tried his vicious upper cut, but fell short, and as the round closed Murphy gave him another good smash on the ribs. Round Twenty-three -- Not a blow was struck.Round Twenty-four -- Murphy cornered Weir against the rope and got in another crack on the Spider’s ribs. This was the only blow of the round. Round Twenty-five -- Weir lad and the men clinched. After the break-away Murphy, with a rush, knocked his antagonist against the ropes. In doing so, however, he slipped, but regaining his feet quickly, chased Weir until time was called. Round Twenty-six -- This was a walk-around, but just at the close there was a sharp exchange, and the round ended with a clinch. The men stood with their hands down during the 27th, 28th, 29th, 30th, 31st and 32d rounds, not a blow being struck. Round Thirty-three -- Murphy at last makes a little rush, but no result followed. The Spider seemed to have recovered his wind and spirits and resumed his dancing tactics practiced early in the fight, but kept well away from Murphy.The next thirteen rounds were without result and not a blow was struck, the men standing looking at each other, and the crowd urging them to fight. The Spider’s hands looked bad, and there was a great big swelling on his elbow.Round Forty-six -- McAvoy, the Spider’s backer, tells his man to stand up in the middle of the ring and fight. Weir seems reluctant to obey, and the same old story follows until the fifty-first, when Weir varied the monotony by getting in a good one on Murphy’s eye. They soon relapsed, and the 52d, 53d, 54th, 55th, 56th, 57th and 58th rounds passed without a blow being struck. When the fifty-eighth round was called, and the men resumed their old tactics, many of the spectators left, and the backers and seconds seemed to have no more interest in the affair. Murphy’s eyes were getting better all the time, but he looked terribly bunged up. Weir, too, had a neat little lump under his left eye, and his ribs were pretty well smashed up.A SPLENDID RALLY. Round Fifty-nine -- Both men started out ferociously, as if they meant to kill each other, but the old game was soon resumed and continued till the sixty-seventh, when the Spider made his splendid rally, and, with a bang, crack, smash, seemed to hit Murphy when he pleased. Towards the end he had the little Englishman a bit groggy, and McAvoy yelled to the Spider to finish him, but Murphy seemed to be able to take care of himself, and time was called. At this junction Weir’s backer asked to have the rules changed to those of the London prize ring, so that the men could be made to fight, willing or unwilling, but this met with a storm of objection and was withdrawn.Round Sixty-eight -- Weir went at it again, but was not able to do much damage, and this proved the last fighting round of the battle. The men simply stood up during the next twelve rounds, and at the end of the eightieth Billy Myers announced the postponement of the fight until some time before Tuesday next, and the sports at once fled to the depot. It was a weary crowd that boarded the train, and soon the majority were cuddled up in the car seats.Fast asleep, or, too famished to rest, were sitting bolt upright, gloomily cursing their luck, and vowing never to go to another fight. When the gang at last emerged from the train in the depot at Chicago, a number of travelers, newsboys and railroad men were standing at the gates gazing curiously at the muddy, unkempt one hundred high-rollers. The centers of attraction were Weir and Murphy. The Spider’s face was a variegated blue and ghastly yellow mass, but comparatively free from cuts or swelling. Murphy’s countenance was a horrible sight, both eyes closed, the features puffed almost out of semblance to anything human and rendered more so by the crisscrossed sticking plaster which revealed rather than hid his gashes. He was not anxious to be observed, and, using an extra overcoat as a sort of cowl to hide his battered head, limped to the door of the depot and dropped into a carriage in waiting. It was just 10:30 a. m. Sunday, and in a moment the spectators of the world’s championship feather-weight prize were lost to view among the little knots of people on the street, hurrying to divine worship. at Kouts, Indiana, on Sunday, March 31, 1889. Source: Life Magazine, June 28, 1937. Life Magazine, Chicago, Cook County, Illinois; June 28, 1937; Volume 2, Number 26, Page 69. Advertisement for Silver Dollar, Straight Bourbon Whiskey. St. Paul Daily Globe, St. Paul, Ramsey County, Minnesota; April 1, 1889; Volume 11, Number 91, Page 1, Columns 1-3. Column titled "Innocuous Infants: Ike Weir and Frank Murphy Find the Walking First-Class in Indiana." The Wheeling Intelligencer, Wheeling, Ohio County, West Virginia; April 1, 1889; Volume 37, Number 189, Page 1, Column 5. Column titled "The Weir-Murphy Fight." The Pittsburg Dispatch, Pittsburg, Allegheny County, Pennsylvania; April 1, 1889, Volume 44, Number 53, Page 6, Column 1. Column titled "Couldn't End It: Ike Weir and Frank Murphy Fight 80 Rounds and the Battle is Postponed." The Evening World, New York, New York County, New York; April 1, 1889; Volume 29, Number 10086, Page 2, Column 1. Column titled "It was a Walking Match." The Salt Lake Herald, Salt Lake City, Salt Lake County, Utah; April 2, 1889, Volume 19, Number 261, Page 5, Column 2. Column titled "The Weir and Murphy Fight." Weekly Bismarck Tribune, Bismarck, Burleigh County, North Dakota; April 5, 1889; Volume 16, Page 1, Column 3. Column titled "The Little Pugilists." hi, im just here for the information.